Within the cells of our bodies, fluids flow rapidly through miniscule, nearly frictionless, protein channels. Until now, human-made nanoscale structures have not been able to mimic those same speeds because the fluids flow slowly along the walls of the tiny structures. 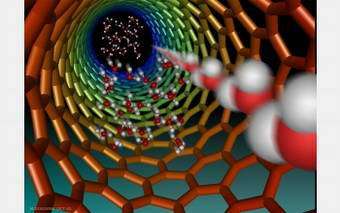 Researchers have now found that carbon nanotubes only 7 billionths of a meter in diameter can channel many fluids nearly friction free. With some fluids, the interiors of the tubes were so slippery that substances sailed through 10,000-100,000 times faster than models had predicted. For the experiments, chemical and materials engineers Bruce Hinds, a National Science Foundation CAREER awardee, Mainak Majumder, Nitin Chopra and Rodney Andrews of the University of Kentucky fabricated membranes made from billions of aligned carbon nanotubes. The fabrication techniques easily adapt to large-scale production, which is important for industries that could use such membranes for separating commodity chemicals. Hinds and his colleagues crafted the membranes so that each side can have different chemical properties. As a result, the selective membrane could one day be used to deliver drugs through the skin or in specialized chemical sensors. The findings appeared in the Oct. 3, 2005, issue of the journal Nature.